RedRat Device Manager is a simple software application intended to help with the installation and set-up of RedRat devices, providing basic testing of their functionality. It is not intended as an end-user application; once devices have been installed and configured, other software applications can then use them. When the application launches the first thing it will do is initiate a search for RedRat hardware. By default the RedRat Device Manager will look for devices connected to your PC via USB and to your network. The network search uses a UDP broadcast and waits for a response from devices. While the USB search is instantaneous, the network search takes a few seconds and so if you are only interested USB devices then the search can be made quicker. In the options dialog (File → Options) there is the option of excluding network devices from the search. Once the search has finished all devices found are then listed in the main window and additional searches can be initiated manually at any time via Devices → Find. If UDP broadcasts are not permitted on your network, then you can manually add an irNetBox or RedRat-X using its IP address by going to Devices → Add (IP Address). If you find that you can’t communicate with a device because the IP address is not correct for your network, for example it has been moved from one network to another, then there is a mechanism in place for resetting its IP address (Devices → Set IP via MAC Address). The information you need for this is slightly different for different devices. The last two bytes of the device’s MAC address. This can be found on the back of the irNetBox, or on older units, by removing the lid and looking at the number on the XPort network module. The IP address that you would like to give the irNetBox so that it will work on your network. You can also give it the address 0.0.0.0 which will instruct the unit to use a dynamic IP address from a DHCP server. For the irNetBox-IV and RedRat-X you will need the device's full MAC address. For the irNetBox-IV this can be found by cycling through the front panel display menu while for the RedRat-X this is printed on the underside of the device. This will instruct the unit to use a dynamic IP address. Once the necessary information is provided a change IP address instruction is sent to all devices via UDP broadcast. However, only the device with the correct MAC address will respond to it. A new search will then commence and your device should appear in the main window. If one of the listed devices is selected, some general information about the device is displayed in the right hand panel of the application. These are informal device identification fields that can be changed to help identify individual devices. The values are stored on the PC on which the RedRat Device Manager is running, and so are not network wide, but are used by all RedRat software so will appear in other applications run on the same PC. Name: A text name given to the device to help identification. This information is stored in the PCs registry, keyed on the MAC address. Description: More detailed information about the use or location of the device. This information is stored in the PCs registry, keyed on the MAC address. For the irNetBox-IV and RedRat-X, the name is also stored within the device itself and is visible across the network. It can therefore be treated as a global property. A connection to the device is needed to change the name for these devices – see Hardware/Firmware Configuration. These fields show top-level information about the type of device. For the various irNetBox versions and the RedRat-X, this information is displayed in the following table. BROADCAST: This is the default, using a UDP broadcast to initiate a response by the device which returns its IP address. IP_ADDRESS: Setting the lookup method to this value gets the software to store the device’s current IP address and always uses this for connecting to the device. This value only really makes sense if the device has been set to use a static IP address. Note: If the RedRat Device Manager and other RedRat software cannot discover devices via the broadcast mechanism, for example if UDP is blocked on the network, then the devices must be assigned a static IP address to use. For irNetBox I-IIIs, these fields show general information about the network interface. The network interface uses the XPort from Lantronix, and is specifically configured for operation in the irNetBox. There are some minor configuration differences between the different irNetBox versions. Configuration Status: Indicates whether the XPort has been set-up for correct operation within the irNetBox. This should always be OK, but there may be the occasional situation in which the configuration is lost, for example if the XPort’s firmware is updated. If this occurs then the entry for the irNetBox will be highlighted in red in the main window and the XPort needs to be reconfigured - see Configuring an IRNetBox's XPort. XPort Type: Gives the version of the XPort that is used. XPort CPU Performance: Gives the performance/power mode of the XPort's CPU. For devices that have IR capabilities, double clicking on them will show an IR Input + Output window. For a selected device the window can also be shown via Devices → IR Input + Output or by right clicking on the device. The right hand side of the window allows control of various aspects of the device. The purpose of this dialog is to validate that we have network communication with the device, to help install the stick-on emitters and to ensure that the A/V equipment under control responds correctly. Blink: Causes all output indication ports on the front panel of an irNetBox or both LEDs on a RedRat-X to flash. This quickly validates communication with RedRat devices. Continuous test: For irNetBoxes an extended test can be conducted. For the irNetBox I-III a repeating LED pattern can be displayed while for the irNetBox-IV the text on the display panel can be set. This establishes operation validation and reliable communication with the device. To test signal output, use this area to learn/capture an IR signal from a remote control. The application stores a single signal only – for full signal database management please use the IR Signal DB Utility. 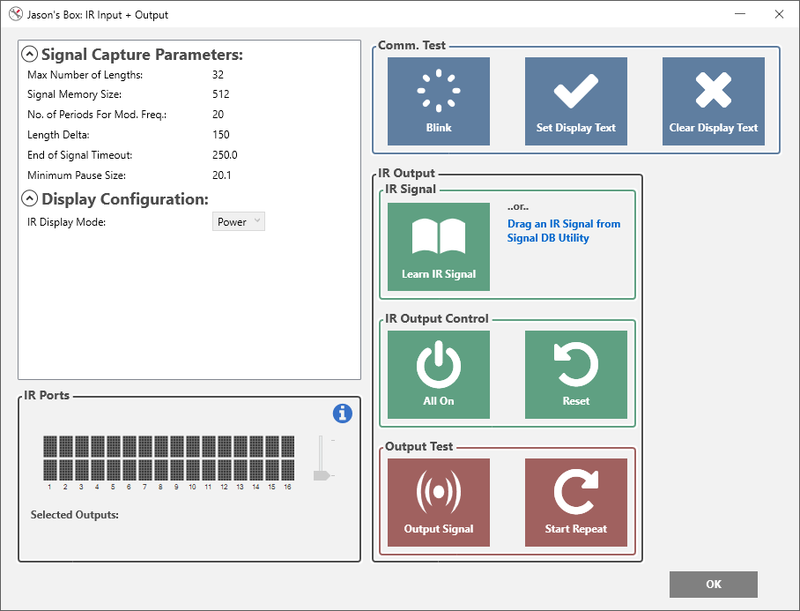 Learn Signal: Starts a signal input/learning operation. The remote should be placed about 10cm from the detector during learning. Drag Signal: Drag an already learnt signal from the IR Signal DB Utility. For irNetBoxes and RedRat-Xs, these areas allow the testing and validation of the IR outputs, for example to check that output number 4 is actually wired up to a particular device. The state of the device’s ports is indicated by a graphical representation and selecting an output will enable/disable it. There is a default power level setting but the power levels of individual outputs can be changed by right-clicking on them. All On: Enables all IR outputs. Reset: Puts the IR outputs into the reset state, i.e. all off. Additionally, for the irNetBox-IV there are two display modes; Blink and Power. Blink replicates the display behaviour of the LEDs on previous versions i.e. on/off, while Power allows various power levels to be displayed. The display mode can be changed in the top-left hand panel of the window. Output Signal: This will output a learnt/captured signal through all IR outputs that have been enabled. Start/Stop Repeat: This starts or stops a sequence of repeatedly outputting the IR signal through each output. Such a test can be useful for irNetBox/RedRat-X installations. For example, when placing a stick-on IR emitter, it can be moved around while the IR signal is being output until the optimum position is found. These parameters are used to adjust the exact behaviour of signal input. In cases of difficulty when capturing a signal, these values can be adjusted to improve signal learning, however this is not generally needed. The parameters are all returned to their default value if the device is restarted. They can be changed in the top-left hand panel of the window. Max Number of Lengths: The maximum number of length values (the signal alphabet) that can be used in a single signal. This parameter cannot be changed for the irNetBox-IV and RedRat-X. Signal Memory Size: The number of bytes allocated to hold the IR signal data. No. Periods for Mod. Freq. : The carrier or modulation frequency is measured during the first pulse of the IR signal. The larger the number of periods used to measure, the more accurate the result is likely to be, however some signals have short initial pulses, so in some case it may be necessary for applications to adjust this value. Length Delta: RedRat devices use a set of lengths as the alphabet to represent most IR signals. Due to the approximate nature of IR signal data, two supposedly identical values will be slightly different, so this attribute controls the maximum variation allowed between values for them to be considered the same. End of Signal Timeout: The value for the IR dead period at the end of a signal used by the device to determine the end of a signal. Units are in ms.
Min. Pause Size: Any periods of IR inactivity shorter than this value will be stored as part of the signal. Units are in ms.
A Hardware/Firmware Information window can be shown for some devices via Devices → Hardware/Firmware Info or by middle or right clicking on the selected device. The purpose of this dialog is to reconfigure the device if necessary and to update its firmware. Network information is given in the left hand panel of the window for devices that can connect to a network. MAC Address: The globally unique number of this Ethernet interface, and so it is also used as the key for storing additional information on the host PC. IP Address: This is the address that has either been automatically assigned by DHCP (dynamically) or explicitly (statically) given to the device. Subnet Mask: Indicates the network segment or subnet/network class on which the irNetBox resides. Gateway: The IP address of the router for this network, however this is not generally used as RedRat devices do not attempt to make outgoing connections. IP Address Assignment: This indicates how the IP address is being assigned. This allows the user to set some of the network information for the device. Restart: This will restart the XPort, however this is generally not needed as configuration changes to the XPort cause it to restart anyway. Assign IP: Set the IP address, Subnet Mask, Gateway or IP assignment mode of the device - see Network Configuration. Restart: For the irNetBox-III/IV and RedRat-X, this restarts the device. Previous irNetBox versions did not support this feature. This should not normally need to be used. Communication test: For the irNetbox this is identical to the continuous comm. test from the IR Input + Output window. For the RedRat-X this is a simple blink operation. For some RedRat devices, upgrading or downgrading the firmware is supported. The current firmware version is given in the left hand panel of the window. 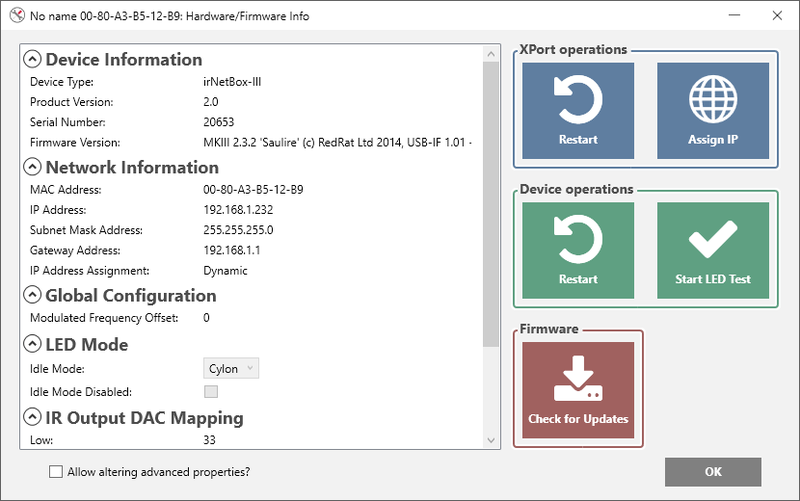 RedRat Device Manager checks for firmware updates whenever a device's IR Input + Output or Hardware/Firmware Info window is opened and a notification appears in the window title bar if an update is available. If in the options dialog (File → Options) the source for firmware updates is set to "URL" then the update can be downloaded from the RedRat website and installed. Set the firmware update source to "Directory" if you are wanting to install firmware that is already saved on your PC. For RedRat devices that can host RF4CE and Dual-Bluetooth modules, module information is listed in the left hand panel. Here, the module firmware can be updated. For the irNetBox-IV, the power levels of the various board supplies can be read and are given in the left hand panel of the window. For the irNetBox-III, the firmware configuration is also listed in the left hand panel. Configuration properties are read-only by default but can be edited by checking the "Allow altering advanced properties" box. If an irNetBox's XPort loses its setup or is completely reset, the irNetBox will not be able to function, so the XPort will need to be re-configured. This is done via Devices → Configure XPort or by right clicking on the selected device and care should be taken when doing this to ensure that the correct irNetBox version is set. By default, the configuration steps will not allow changing the irNetBox type. This, however, can be overridden in the options dialog (File → Options). Another issue that can happen if the XPort loses configuration information is that RedRat applications and software will not think it is an irNetBox, so will not list it. In this situation, in the options dialog the option "Accept responses from hardware not explicitly labelled as a RedRat device…" can be selected. Note: Care must be taken with this as there may be other devices on the network using XPorts and so these should not be configured as irNetBoxes! So only use this option if you recognise the IP/MAC address as an irNetBox. When delivered, irNetBoxes and RedRat-Xs expect to use a dynamically allocated IP address using DHCP, however, they can be assigned a static IP address. The basic configuration of using a dynamic IP address or providing a static IP address is adequate for most environments, but on networks with more restrictions it may be necessary for certain ports to be enabled in firewalls or filters. The irNetBox-IV and RedRat-X host a basic HTTP web server at the device's IP address. Their webpage can be loaded using your default browser via Devices → Device Webpage or by right clicking on the selected device. For the irNetBox-IV and RedRat-X, a firmware update can be installed on multiple devices as a single operation instead of having to do it individually for each device. This can be done via Devices → Bulk Firmware Update. UDP 30718 (0x77FE). Newer versions of RedRat software can use TCP 30718 instead. Added missing package to installer. Supports setting IP assignment to dynamic via broadcast. RedRat-X LED colour bug fixes. Fixed a bug which occurred when RedRat-X was in factory mode. Added RedRat-X LED colour/brightness sliders. Fixed a bug which occurred during RedRat-X module firmware installation. Allows changing RedRat-X network settings via USB. Option to exclude network devices from search. RedRat-X and limited irNetBox-III factory mode support. Fixed a bug which occurs when libusbK driver isn’t installed. Allows changing network settings of XPort-based irNetBoxes. Improved handling of changes to irNetBox-IV network settings. Added access to irNetBox-IV web-pages. Fixed a bug which prevented the irNetBox-IV clock from syncing to PC date and time. Restructured GUI to separate hardware/firmware operations from irNB installation operations. Supports all RedRat products including the irNetBox-IV. Supports software and firmware updates. Uses V4.12 of the RedRat core code. Moved to use .NET 4.5.1. Application renamed from ‘irNetBox Manager’ to ‘RedRat Device Manager’. Improved error reporting in dialog boxes. irNetBox-IIIs using the XPort firmware version X9 caused an error when added by IP address. Added the ability to reset the IP of an irNetBox’s XPort just by using the last MAC address (last two bytes). Added support for XPort-05 (Firmware X9). Further information on this is available here. XPort reset button now works. Reset uC button now works for MK-III irNetBoxes. Fixed a bug where the irNetBox IP address is shown as STATIC where it is set as DYNAMIC. If UDP comms are blocked, irNetBox configuration information can now be read via TCP. Users can change the type of irNetBox if the XPort’s configuration gets wiped – TAKE CARE!!! If two network interfaces on a PC, it used to add an irNetBox twice. Now only adds the irNetBox once. Runs on 64-bit XP and Vista in addition to 32-bit systems.